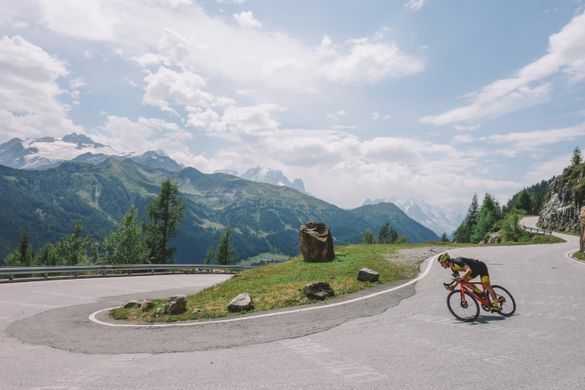 Surrounded by the Alpine roads and mountain passes of Switzerland’s Valais region, ex-pro cyclist and sports science led Kudos Cycling are launching into the 2018 season with a range of new performance coaching and guiding trips. From long weekends to full, week-long cycling holidays, Kudos Cycling’s new packages for 2018 will include sports science testing, Swiss sportive preparation and support, women only performance coaching, as well as expert guiding around the well-known Alpine climbs, long descents and vineyards of Switzerland’s roadie paradise, the Valais. Kudos targets the sportive challenger, looking to hone their skills or performance by providing coaching from ex-pros and sports science testing at the Swiss Olympic Medical Centre in Sion. The holidays would suit a wide range of cyclists – women who want to take their performance to new heights in the company of other like-minded female roadies; or even groups of riding buddies looking to experience the thrills of riding in the Swiss Alps for the first time – Kudos Cycling tailors packages for every rider. Groups or individuals will work with Swiss ex-professional cycling coach Guillaume Bourgeois and the Kudos Cycling team, defining their goals, testing fitness with a lactate analysis, taking on tailored training rides developed by local pro Steve Morabito, developing a training plan with a coach for the rest of the season, as well as on and off-the-road coaching and performance analysis to take them to the next level. Price: from £1,711 including transfers from Geneva Airport, stylish and bike friendly accommodation in Martigny, all meals and snacks, pro mechanic bike building on arrival and before departure, plus branded Katusha cycling jersey. For women who want to take their Alpine cycling skills and fitness up a notch. Trips are tailored to individuals or groups of club mates or cycling buddies, so that all levels can be catered for with a combination of different riding types throughout the trip – both to see the best Alpine scenery the Valais has to offer and improve the performance and cycling skills of those who want to raise their game. Without the distraction of any MAMILs. Price: from £2,179 Including four days of guided and vehicle supported rides, all meals and snacks, 6 nights luxurious bike-friendly accommodation at the 4* Hotel de Bains de Saillon, with its thermal baths for recovery, airport transfers and branded Katusha cycling jersey. Ideal for beginner Alpine cyclists or those who simply want to experience the splendour of riding through the Swiss Alps without any of the ‘faster, fitter’ performance cycling pressure. The tailored itinerary of fully supported and guided rides is designed to boost confidence and develop bike handling and group riding skills. Price: from £1,735 including four days of vehicle supported and expert guided riding – tailored to a group’s level, stylish and bike-friendly accommodation in lively Crans Montana, all meals and snacks, group transfers from Geneva Airport, daily team briefings each morning, in-the-field coaching, support and feedback, welcome pack and branded Katusha cycling jersey. Whether a rider is in training for a sportive or charity bike ride, or needs coaching to develop Alpine or group riding skills, or just wants a fun weekend riding on the roof of Europe with some riding buddies – Kudos Cycling has a completely tailored Alpine Cycling experience available. For example, a group who wants a cycling trip that delivers them – literally and performance wise – in perfect form to the start line of one of Switzerland’s famous sportives – whether it’s the beautiful Cyclosportive des Vins du Valais, or even the truly epic 278km Alpenbrevet, with its punishing cobbles on the awesome St Gotthard Pass – this is what Kudos can offer. Price: On application. Includes daily guided rides and support, stylish bike-friendly accommodation in handpicked hotels, all meals, group airport transfers, branded Katusha cycling jersey, post ride de-brief sessions. Kudos Cycling offers performance focused training camps and guiding based in the Valais region of Switzerland. As well as being the home of the UCI in Aigle, the region has also hosted the biggest Tours and names in road cycling, including the Tour de France, Tour de Suisse and the Tour de Romandie. Kudos Cycling’s team of cycle enthusiasts, coaches and ex-professional cyclists includes founder and owner Anthony Walker, coach and ex-professional rider Guillaume Bourgeois, professional cyclist, Master in Sports Sciences coach and ride guide Arnaud Rapillard, UCI trained mechanic, nutritionist and women’s performance specialist Tess Lawson, professional triathlete Jack Lawson and qualified tour leader Rob Spears.